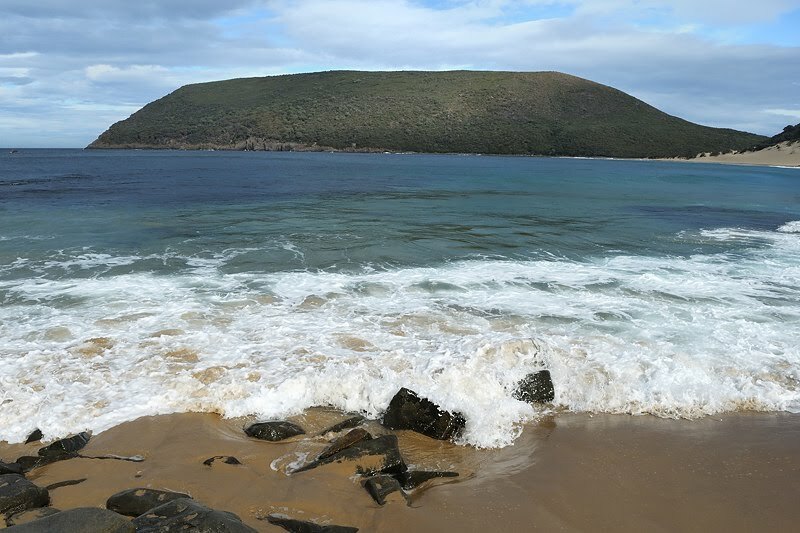 To round out the Tasman Peninsula weekend, I did Mount Brown and then walked on to Cresecent Bay. See previous exploits, which include a map. The cliff on the south-western side of Mount Brown remains a "high"light. The shape of the top of the cliff means people like me with borderline height-tolerance can securely sit with a leg, or even two, dangling over this 170+m cliff without feeling insecure. It gives a great vertical view to the sea, and back towards Remarkable Cave across Dauntless Point. Mind you, this is where I misplaced Phil for a few slightly concerning minutes on a walk a while back. The photo here is of Cape Pillar from the Mount Brown trig, with The Blade in clear view protruding at the right. 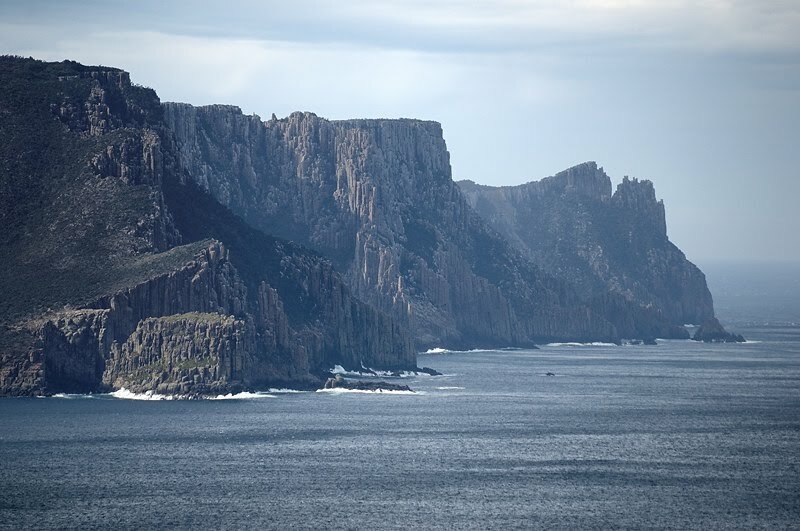 Mount Brown affords great views of both Cape Pillar and Cape Raoul, along with their related topography, as well as of the whole of Port Arthur. Crescent Bay is superb, although not necessarily a nice safe swimming beach. 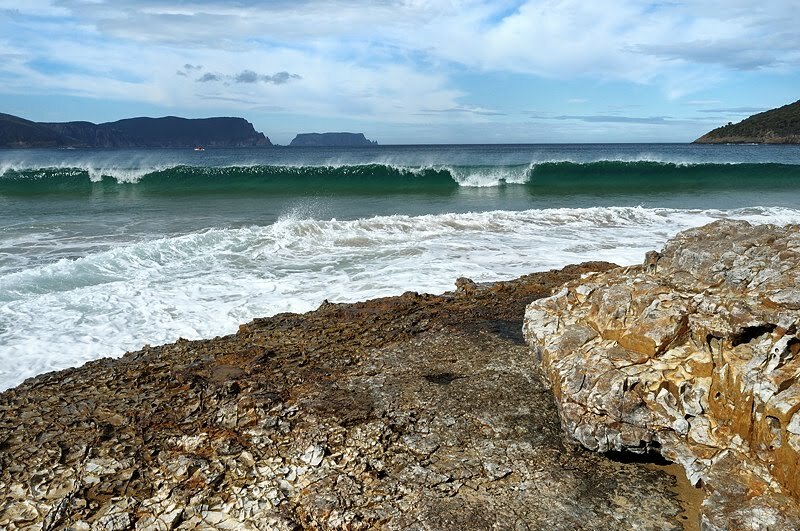 The waves break beautifully at times, but the beach falls away quite steeply. Looks good for fishing. In the middle of the beach is this rocky outcrop, with a big dune that drops steeply behind it. The rocky outcrop looked to me like a metamorphosed mudstone or similar, which shows the obvious signs of salt water weathering. It's really quite interesting. David Leaman confirms in "Step into History in Tasmanian Reserves" some of my inexpert assessment, but adds a lot more information. This is Mount Brown as seen from the northern end of Crescent Bay. The cliff is on the far side. Crescent Bay's most notable feature is its tall dunes. There were people sliding down the dune in the middle of the beach on sandboards and other items. I'll do a blog about sand dunes sometime soon, but they didn't seem concerned about their use of the dune in this way. Other people do the same down the dunes at the northern end at times too. I don't know really, but I do know the dunes at Crescent Bay have been there for 20 years, and don't seem to have diminished. Perhaps the wind restores them. I see there are some track notes for this walk here.